Order your Montblanc Limited Edition 1906 Heritage Rouge and Noir Spider Fountain Pen - Medium today from FahrneysPens.com. Fine Pens, Refills & Luxurious Gifts – great prices & fast shipping. The 1920’s Montblanc spider clip takes center stage in the collection. The cap top holds the traditional ivory snow cap, embedded in coral red precious resin, recalling the vintage Rouge & Noir. 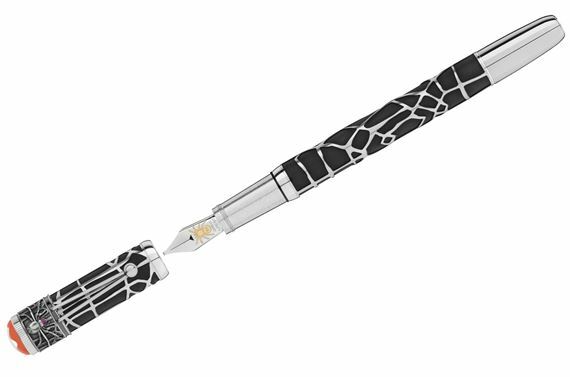 The Special Editions in black or coral lacquer with precious resin include a piston-filler fountain pen with 14K gold spider-engraved nib, rollerball and ball pen. The black is adorned with antiqued sterling silver fittings. The Limited Edition 1906 Spider has a stunning solid 925 sterling silver cap and barrel cast in a web design with a vintage look. The sterling spider clip ring is set with red gemstone eyes. 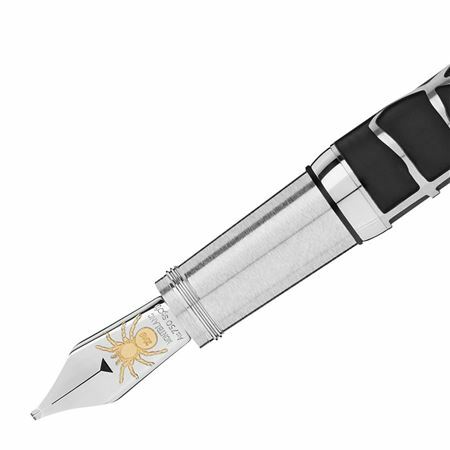 The Limited Edition fountain pen features a beautiful two-tone, 18K gold and rhodium nib engraved with a lucky spider. Montblanc also presents Spider Grey ink and refills.